In a panel session organized by Center for Strategic and International Studies (CSIS) in Washington D.C., Mr.R.Sampanthan and Gajendrakumar Ponnambalam, Tamil National Alliance (TNA) parliamentarians, told the audience that implementation of Interim Self Governing Authority (ISGA) proposed by the LTTE is critical to sustainable peace. Ms.Teresita Schaffer, former U.S. Ambassador to Sri Lanka and CSIS Director of South Asia program presided the meeting. The MPs said that the duplicitous acts of the current United Peoples Freedom Allianc (UPFA) government and its complicity in creating instability in the east have created a significant credibility gap. There is a real danger that Cease Fire Agreement (CFA) may collapse unless immediate measures are taken to stop the situation deteriorating further, the MPs warned. "The only way to salvage the peace process is to commence talks on the ISGA. The Government should stop its attempts to destablize the east and engage earnestly in talks if it wants to pursue peace," Sampanthan said. Mr. Ponnambalam said the power struggle between the main Sinhala parties and, the vehement opposition shown by the Peoples Alliance (PA) leadership while they were in the opposition to every positive progress in the peace talks, did not give him any confidence that the present Government is genuinely interested in peace. "Even if we assume that Sri Lanka's President is interested in peace talks, the JVP, whose ambition is to capture power itself, is unlikely to support any constructive dialogue with the LTTE," Mr. Ponnambalam said. 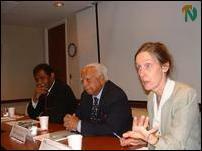 Ms.Schaffer, the first high level U.S. official to mention a "confederal arrangement" as a possible solution to Sri Lanka's conflict, said that in Sri Lanka's political history there have been many instances of "too little too late," when it came to Sri Lanka Governments offering solutions to the ethnic conflict. She said that CSIS makes policy recommendations and CSIS is not necessarily concerned about the reaction of the affected parties. The parliamentarians also met with Ms Christina Rocca, US State Department Assistant Secretary for South Asian Affairs and Donald Camp on Tuesday and Wednesday, according to sources close to the parliamentarians.